Most of the time the volume you set on the iPhone “just works.” But it’s far more complicated than you’d think, and it’s very context dependent. Macworld describes it well. Most of the time, you hit a volume button on your iPhone, iPod touch, or iPad, and it does what you expect, whether it’s turning up your reminder alarms or turning down your music. And then there are the other times. But once you understand the different “kinds” of sounds, the interaction between software settings and the volume buttons, and how context overrides the default course of events, you’ll have better control over your device’s volume. The key to mastering volume adjustment is understanding that most of the sounds on your device fall into one of two categories. General audio includes music and other media, and the voice volume on the iPhone and for FaceTime on all devices. The “ringers and alerts” category includes not only the iPhone ringer, but also: FaceTime rings; Clock app alarms; notifications and individual app alerts; keyboard clicks; and miscellaneous app sounds like the whoosh of sending Mail. The volume buttons “just work” most of the time because they’re context-sensitive. If, for instance, you’re in the Music app, the buttons change the media volume even if you’ve set them to control Ringers and Alerts; this happens even if the music controls are merely showing, on a Lock screen or in the multitasking bar, with no music playing. Conversely, when media volume is the default, you can change the Ringer volume when an alarm is playing. These changes affect the overall volume setting for that category, not just temporarily or for the current sound. The volume icon that appears when you use the buttons helpfully indicates what you’re adjusting. With Ringers and Alerts as the default, press a button when you’re on a Home screen with no music playing and the icon is labeled Ringer (on the iPhone) or Sound Effects (on other devices). If Ringer and Alerts is turned off, you get the unlabeled icon that stands for general audio. If you’re using headphones, it’s their volume that’s altered, not the device’s speaker, and the volume icon notes that. As for controlling the volume in games, that’s complicated. Many games are set to the Ringers and Alerts volume when you first run them; some interact with that setting if you change the game volume. Some newly launched games inherit the volume level from the last game app you used. A game remembers its own volume setting from its previous use if it’s been sitting in the multitasking bar. Luckily, no matter your default setting for the volume buttons, they will always control the volume of the current game. Want Siri to talk louder, or to lower its voice? Neither general audio nor Ringers and Alerts volume settings affect that. To adjust both the little chirp and the voice volume, start Siri with a press of the Home button, and use the volume buttons while Siri’s open. You can prevent the youngling from upping the volume by locking the level with a passcode. Go to Settings > General > Restrictions; tap Enable Restrictions if necessary, and supply a passcode. Tap Volume Limit and then Don’t Allow Changes. Volume isn’t the only thing that depends on context. How you mute your device can depend on which device you’re using, the situation, and hardware or software settings. When your iPhone is ringing, hit either volume button to temporarily mute it; this also works for FaceTime rings on any device. 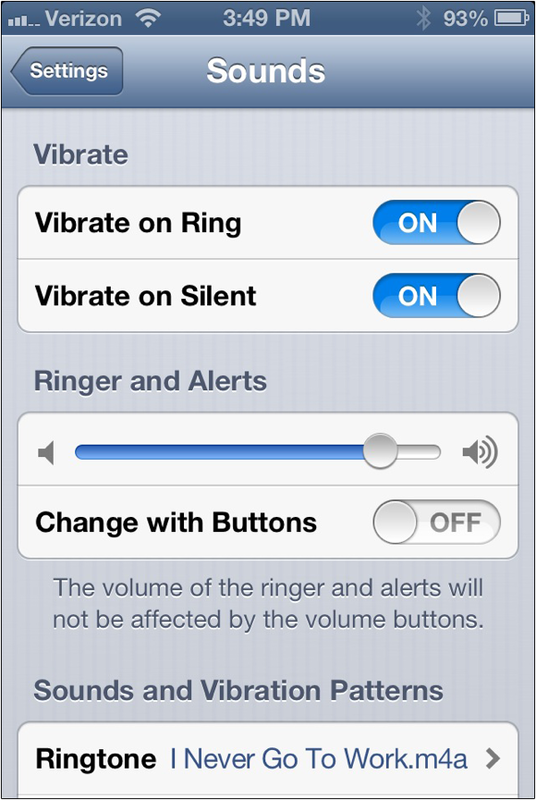 On the iPhone, flip the Ring/Silent switch to kill the ringer; it will still ring through headphones. This also mutes Calendar and Reminder alerts, most games, and other sound effects (including the camera shutter) but not alarms—an important point if you’re sitting in the front row for the New York Philharmonic. On an iPad, use the Side Switch to mute button ringers and alerts; it doesn’t affect music or other media. In Settings > General, under Use Side Switch To, tap Mute. To override the setting, or mute the iPad when the Side Switch is set to Orientation Lock, see the details in Lex Friedman’s guide to muting notifications. You can also mute the volume with the volume button: Hold down the lower end for about two seconds. Use Settings > General and turn on Do Not Disturb to silence notifications during the times you specify. This works only when your device is locked, and does not affect alarms. You can mute certain sounds for some individual apps in Settings > Sounds. Tap New Mail in the Sounds list, for instance, and then tap None. This entry was posted in mobile tips, tips by montg. Bookmark the permalink.